This works well for winter cake sales or food presents. Preheat the oven at 180 degrees. Put the butter, sugar and golden syrup in a pan and melt it. Take it off the heat, add the rolled oats and finally the coconut. Put it all on an oven tin (grease it beforehand or cover it with a silicon mat). Leave it in the oven for 20 minutes. Then take it off the oven and wait for 10 minutes. Score it into squares and then wait until it is completely cold. Cut it into squares and eat. I have been trying to avoid adding this recipe to the blog as there is something a bit too obvious about Spanish people cooking tortilla. But a tortilla with a glass of beer and good company on a sunny day is hard to beat. And a hot 'bocadillo de tortilla' (omelet inside a piece of crusty bread) on a cold day is pure indulgence. There are as many recipes of tortilla as Spanish people: some like it with onion, some with leeks, some with just potatoes and eggs, some prefer it 'blonde' some 'dark', some 'runny' some 'dry'…just try a few times and find the recipe that you prefer. My advice: do not add chorizo, nor peppers- a tortilla with that is just a bit of a mess. Be generous with the salt. Also, you need a good non stick (medium size) pan and very hot oil. Chop the potatoes into really thin slices (by hand or with a food processor). Cut the onion into small squares. Mix the onion and the potatoes and add salt. Put a really generous amount of olive oil in the pan ( medium heat), add the potatoes and onions, lower the heat to its minimum setting, cover with a lid and let it fry the until the ottos are golden and soft ( more or less twenty minutes). When the potatoes are done put them into a colander to get rid of the excess oil (but keep this oil). Beat the eggs. Add the potatoes to the eggs and add a tiny bit more salt. Put three spoonfuls of oil (you can use the oil from the potatoes) in the pan and heat it under it is very hot. Add the eggs and potatoes mixture and lower the heat to medium/low. Once you see bubbles on the surface (10-ish minutes) turn the tortilla around. This really seems more difficult than it is - you can do it with a big plate or a lid (I do it over the sink just in case some of the eggy mixture falls down) Let the tortilla cook on the other side (another 8 minutes more or less). You can eat it hot or cold. This has a sweet-ish taste, so it is a good way to get children to eat cabbage. It works very well with roast pork or beef. Heat the oil in a pan (medium heat). Add the onion and fry it until it becomes golden (light) - this will take 5-6 minutes. Add the red cabbage and the apple and let it fry for 5 minutes. Then add the salt, balsamic vinegar and water. After 4-5 minutes reduce the heat and let it all simmer for 50 minutes until the cabbage is soft. Heat the oil and butter in a deep pan. Pour two glasses of boiling water over the dried porcini and let them rest until they become soft) Add the onions and garlic and let it cook over slow heat until they become soft and translucent. Add the sliced mushrooms, then the porcini (without the water) and the parsley and let it all cook for 10-15 minutes. Add salt, the bay leaf and the stock and let it all boil for 20-25 minutes. Add the creme fraiche and mix with a hand held blender. We fried slices of mushrooms and served the soup with them on top. You can do this with courgettes, carrots, potatoes or any combination of the three. - olive oil to fry. Mix all the ingredients. Heat the olive oil in a frying pan. Drop spoonfuls of the mixture into the oil. Wait for 2 or 3 minutes until the fritters get a golden colour, turn them around, fry them on the other side and take them out. It is best to put them on a plate lined with kitchen paper to get rid of the excess oil. As always be careful with the grater as children forget that a grater is similar to a knife. These started with a (very good) Nigella recipe for orange muffins that we use sometimes (though generally children prefer pancakes to muffins in the morning). The orange muffins are so simple that they require jam, so one of my sons tried the recipe with blueberries and the result is much better. Mix the flour, ground almond, sugar, baking soda, bicarb and orange zest. Separately mix the egg, milk, orange juice and melted butter. Pour the liquid over the dry ingredients and mix (not too much). Fill in the muffin cases (you should have enough for 12). Put the blueberries on the muffins, pushing a bit down so that half of each blueberry is hidden in the mixture. Bake for 20 minutes. Children like this, but you have to be really careful if they help you to prepare this as they have plenty of opportunities to burn themselves. The recipe looks laborious but it is really easy to make. You need to prepare a caramel first and then the flan. These quantities are enough for 6 small flans. We use small (metal) pudding basins but you can do this in normal ramekins and you can make a big flan (in a big pudding basin or in a pyrex bowl). Preheat the oven at 150 degrees. For the caramel, put the sugar and water in a pan over medium heat. Let it bubble without touching it (do not stir) until it gets to a dark golden colour ( it takes 3-4- minutes only but you have to watch it carefully as it is easy to burn it). Pour the caramel over the flan ramekins so that it covers their base. For the flan, heat the milk until it is about to boil. Separately in a bowl mix the eggs, yolks and sugar and beat well. Add the hot milk while you keep stirring and finally add the vanilla essence. Pour the mixture into the caramelised pudding basins. Put the basins on a deep oven tray and into the preheated oven. Pour carefully boiling water into the tray (up to one third of the hight of the ramekins) so that you get a 'bain marie'. Let them cool down for at least 2 hours and get them out of the basins by going around the edges of the basins with a snap knife first. They keep for 2-3- days in the fridge (the easiest is to keep them inside the basins). Yes I know, we have a bit of a 'soup thing' lately, but after getting soaked watching/playing rugby, a soup is nice. Heat the oil and fry the onions and garlic over low heat until they become translucent. The add the spinach and lemon juice. After 5 minutes add the boiling water, creme fraiche and salt. Let it boil for 5 minutes and blend it. Preheat the oven at 200 degrees. Cut the tomatoes in quarters and the onions in eights. Put them on a roasting tin and add the salt, oil and balsamic vinegar. Roast for 45 minutes until the edges get dark. Boil the water and add it to the roasting tin - scrap the burned bits with a wooden spoon (as you would do to prepare gravy). Put it all in a pan and blitz it with a hand held blender (or in a food processor). You can add more water if you find it too thick. If the result is too acidic (it really depends on the quality of the tomatoes) you can add a quarter of a teaspoon of sugar. You can serve it with parmesan shavings, with croutons, you can also blitz a few leaves of basilic with olive oil and pour a few drops on top.... we like it on its own. Lots of countries have a version of rice pudding. This one comes from the north of Spain. - 1 l of milk (preferably full fat). And then around 350 ml more. Wash the rice thoroughly. In a pan heat the milk (1 l) , cinnamon stick and lemon rind until the milk boils. As soon as you see the bubbles add the rice. Lower the heat as much as you can and let it all simmer for 20 minutes. Then add the sugar and simmer for another 25 minutes. You need to stir it often from the moment you put in the rice, as otherwise it will stick to the pan. During the last 25 minutes keep adding bits of milk every time you stir it, especially if the mixture is too dry and it is starting to stick to the pan (we use 350 ml for this because the children like it creamy, but you may be able to do it with less milk). Put it into small bowls and let it set for at least half an hour. We serve it with a bit of cinnamon (very little) sprinkled on top. You can also cover it with sugar and caramelise it with a torch (this is how they do it in Asturias, which claims to have the best 'arroz con leche' in Spain). You can keep this in the fridge for a couple of days (cover it with cling film) - take it out of the fridge for 30 minutes or so before serving it. Children find it very easy to help with this. It is indeed very handy to have them around so that you can take turns with the regular stirring. This is a super-simple dessert. - one teaspoon of water - if you are preparing this for adults, substitute the water by a tablespoon (or two!) of vodka. Cut the pineapple into small chunks. Just before you are going to serve it, put the mint leaves, sugar and water into a mortar and bash them with the pestle (do this in the last minute as otherwise the mint will go brown). Mix it with the pineapple. If you do this for adults, replace the water with the vodka. You can serve it with chocolate brownies - everybody loves it. Reserve a quarter of one of the cucumbers and cut it into small cubes. Put all the other ingredients except the dill into a bowl and blitz them (with a hand held blender - you can also do this in a food processor). This tastes better when it is cold, so leave the soup in a fridge for an hour or so. When you are going to serve it, sprinkle the diced cucumbers and dill on top. ... and another great product that you should enjoy on its own. No need for cooking, no need even for bread with tomato on the side, just eat it as such, maximum with a tiny bit of bread (the beer is mine). The thing about lasagne is that though it looks like 'easy food' it is rather laborious to make. We normally make two and freeze one (freeze it without the cheese on top). Separately put a bit of olive oil in a pan and fry the minced meat separating it with two wooden spoons so that you do not get lumps. Do this until the meat gets brown ( it is difficult to calculate how long this will take as it depends on the quality of the meat - if it is not very good meat you may get lots of water in the pan so you will have to way until all of it evaporates - or just get rid of it with a spoon). Add the meat to the onions and carrots, add the tomato sauce, salt and mix it all well. Add the white wine and let it all bubble under high heat first and then low heat for 15 minutes. In yet another pan prepare the béchamel sauce: heat the butter in a pan. Then add the flour (stirring well so that it does not get burn).After 3-4 minutes add the milk and salt and keep stirring until you get bubbles and then for five or six minutes afterwards while the sauce thickens. If you get lumps just blend the sauce with a hand held blender just after you add the milk. At this point you can start assembling the lasagna: put some béchamel sauce fist, then the meat, then the lasagne sheets, then tomato sauce, then béchamel again, meat, lasagne sheets, more béchamel on top and a bit of tomato sauce. Top it all with the cheese. Bake for 30-35 minutes at 200 degrees. Salt the aubergines. Coat them with flour. Beat the egg and coat the floured aubergines with the egg. Heat the olive oil in a non-stick frying pan and fry the aubergines until they are golden turning them so that they get golden on both sides ( it should take 2-3 minutes on each side) Put them over kitchen paper so that some of the frying oil is absorbed. Serve them with salmorejo so that you deep the aubergines in the salmorejo as you go. The acidity of the vinegar in the salmorejo goes really well with the oily aubergines. Some people prefer to fry the aubergines after coating them in flour ( i.e. not using the egg). They become more like chips. If you do this serve them with a bit of honey (drizzled on top of the aubergines). Today we have finally reached double digits in our earnings: £10.31. After three years doing this... pathetic I know...and the worse bit is that unless we earn £60 Adsense will not send us any amount at all! Anyway, this is a very traditional ice-cream (and cold drink) in the Mediterranean cost of Spain. It tastes a bit like rice pudding but without the rice. Boil the milk, lemon and cinnamon with 40 gr of sugar. As soon as it boils take it off the heat and let it cool down. If you put this into the fridge and drink it when it is very cold this is called 'leche merengada' (literally 'meringed milk') Add the cream to the milk. Separately whisk the four egg whites with 30 gr of sugar as if you are going to prepare a meringue. Mix this with the milk (carefully so that you do not loose the air). Put it into the ice-cream machine (or in a tray into the freezer and move it with a fork various times every hour and a half or so). When you are going to serve it sprinkle a bit of powdered cinnamon on top. You just need to follow our apple jam recipe but with more sugar. For each kilo of apples you need 750 gr of sugar and half a lemon. So peel the apples and cut them into cubes. Toss them with the lemon juice so that they do not get brown. Put them in a pan with the sugar and boil for around 40 minutes (first high heat and as soon as it bubbles reduce it to low heat). Stir it often with a wooden spoon. When the mixture gets brown put it into a tin or in a foil tray. Let it cool down and cover it with the tin top or with the paper of the foil tray ( you can also do this in a plastic container really). If it is properly covered it lasts forever in the fridge. We made ours in September and it is still great in August. Heat the olive oil under medium heat. Cut the tuna diagonally until you get 6-ish thin slices from each stake. If they are very small you can 'hammer' them a bit with a glass or a cup so that they become bigger (and thinner). Salt them. Coat them with flour and then with the beaten eggs. Fry them for a couple of minutes on each side until they become golden. Put the fried stakes on a pan. Add the tomato sauce and the bay leaf and heat it all for 3-4 minutes. Separately mash the garlic in a pestle and mortar. Add the wine and add it all to the tuna and tomato pan. Add the water and the parsley and let it all bubble for 5-7 minutes so that some of the sauce evaporates and all the flavours mix. This dish is better if you prepare it the day before you are going to eat it. If your children are like mine they may not touch the raw tuna, but they were happy to help with the sauce. The children love eating these and it is fun to see the yorkshire puddings puffing up, but you have to be really careful as the oven tray gets seriously hot an it is really very easy for the children to burn themselves. Preheat the oven to 200 degrees. When the oven is hot put a muffing tray with a teaspoon of sun flour oil in each hole. Put the tray into the oven and wait for 15 minutes. Meanwhile mix the flour, milk, salt and eggs with a hand held mixer. Pour carefully the mixture into the 12 holes of the muffing tray (fill them to half only). Be really careful doing this as the fat will be very hot by now. Get it all back into the oven and bake for 12 minutes. This is a very typical tapa in Spain (more accurately this is called a 'racion' rather than a 'tapa') and it was also one of the staple dishes on celebration menus when I was little. Boil the potatoes, carrots and beans into small cubes and boil them (in water and salt) until they are tender. It should take 10 minutes for the potatoes and the carrots and 8 minutes for the beans). We boil them separately so that the flavours do not mix, but if you do not have time just boil them altogether. Cut the eggs into small cubes and mix them with the potatoes, carrots and beans. Drain the tuna and add it (cut into small bits) to the salad. Then slice the olives and cornichons thinly and add them too. Cut the red peppers into small bits, add them to the salad. Finally add the mayonnaise and mix it all taking care not to break the potatoes. Cut the rolled pastry into three rectangles. Spread the mustard on top. Take the sausages out of their skin and put the meat along one of the sides of each of the pastry rectangles. Sprinkle the cheese on top. Fold the pastry over the sausage meat pressing well with your fingers so that there is no air between the sausage and the pastry. Take a fork and press down the sides. Cut the rectangle into small bits ( see the picture). Put them on a baking tray lines with baking paper, paint them with beaten egg and bake them for 20 minutes. These are easy to make, but the dough is very sticky - my youngest son tried to mix it and his hands got 'trapped' in it. Mix all the ingredients in a bowl with a table spoon or with your hands. Preheat the oven at 200 degrees. Make three thin cylinders with the dough and bake them (preferably on two trays as they expand when they bake) for 25 minutes (until they get golden). Take them out of the oven, wait for 5 minutes and then cut the cylinders diagonally in thick slices. Put the biscotti back on the tray (with their unbaked sides looking up) and bake them for another 10 minutes. Get them out of the oven and let them cool down on a cooling tray so that they become crunchy. Mix all the ingredients well with your hands so that all the potatoes are coated in the oil. Put them on a microwave dish, cover it with cling film ensuring there are no gaps and microwave it at 700W for 4.30 minutes. By this time they should be soft (otherwise get them back in for another couple of minutes). Then heat a pan (without any oil), put the potatoes in and let them fry for one or two minutes until they get a bit of a colour. Steam the leaks during five minutes (or boil them for 3-4 minutes) and put them on a dish. Add the edamame beans on top of the leaks (we buy them already boiled. If you buy raw beans just boil them in salty water for 4 minutes). Put all the ingredients of the sauce in a food processor and blitz it until all the ingredients are very thinly chopped and the oil is emulsionated (it normally takes 5 seconds) Add the sauce to the leaks and beans and serve. Add a little bit of olive oil on top of it all just so that the salad gets a nice shine. This is a recipe from my grandmother. Very easy but also very tasty, and yet rather delicate. She used to do this with conger (which was always full of fish - bones) as at the time salmon was simply unaffordable - she could have never imagined that salmon would actually become cheaper than conger or even sardines. Boil the eggs for 10 minutes. Peel them and separate the yokes from the egg whites. Chop the egg whites into small squares and reserve. In a pan mix the olive oil with the egg yokes with a fork (without any heat). Put the pan on the heat. Mash a garlic clove (with the pester and mortar), mix it with the white wine and add it to the egg yokes. When you see bubbles (after a minute more or less) add the water and the bay leave. Sprinkle the salmon steaks with the salt and put them into the sauce. Let them simmer for 3 to 4 minutes (if you like the salmon well done leave it in for another 2 to 3 minutes) You may need to add a bit more salt to the sauce. Right at the end sprinkle the parsley and then the egg yoke. This is not only very easy to make but also a good 'skinny dish' - and children like it too. Heat the oil in a deep pan (under high heat). Add the leaks and fry for 5 minutes, then add the courgettes and the salt and fry for another five minutes. Then add the water, reduce the heat and simmer for 15 minutes. Finally blend the soup with a hand held blender (or in a food processor). Serve on its own or with parmesan cheese. It is interesting for the children to see the changes of texture in the condensed milk, but if you cook this in a express cooker be very careful with the tin, as the tin can explode if you do not handle it carefully. You only need a tin of condensed milk and water. Put the tin into an express cooker (or a normal pan). Cover it with water and cook for 35 minutes on really low heat (or longer if you want a thicker dulce de leche). If you cook this in a normal pan (again on very low heat) you will need to simmer it for 3 hours. Open the tin and there is the dulce de leche. You can it this as a spread on bread or with ice-cream. Mix all the ingredients together and serve with any pork or poultry dish. Preheat the oven at 170 degrees. Mix the eggs, flour, wine, oil and salt. Then add the cheese, tomatoes and basil and mix well (but carefully so that you do not break up the cheese). Put it all into a greased loaf tin and cook for 45 to 50 minutes. Let it cool down a little before you cut it. We eat this often with any meat or poultry (especially good with chicken and roast duck). It also goes well with pasta. Grate the courgettes (thickly as in the picture). Heat the olive oil in a frying pan. 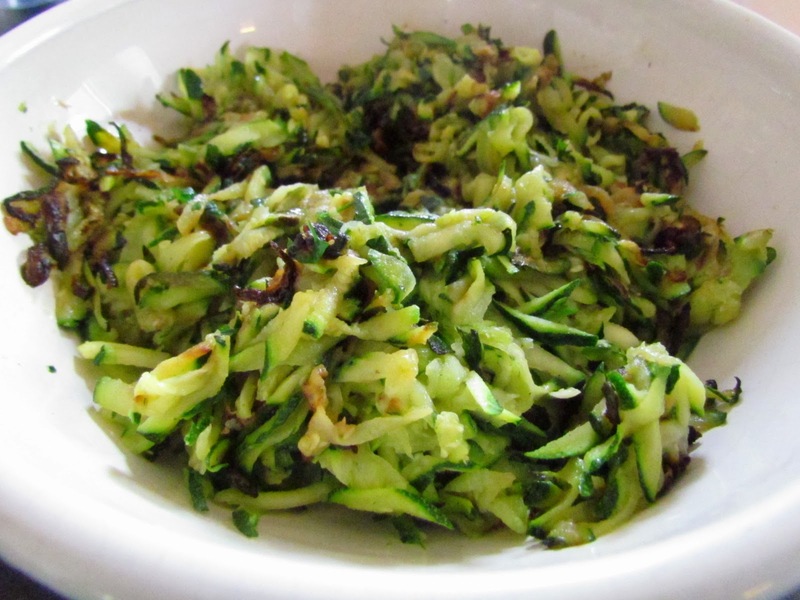 Add the courgettes and let them fry for 8 minutes (stir them a couple of times) then add the salt, the chopped parsley and the grated nutmeg and let it all fry for another 3 to 4 minutes. You can alter all the measurements to your taste. Preheat the oven at 180 degrees. Mix the butter and sugar with an electric mixer until it becomes pale yellow. Separately mix the flour (sieve them if you are not going to use a lot of icing; also, if you are going to cut the cake into shapes then don't bother with the shifting) Add one egg, then one table spoon of flour, then another egg and so on until you use all the eggs. Add the vanilla essence and then add the rest of the flour by folding it into the butter mixture. Bake for 50 minutes (we have done this in all sorts of tins and frankly it always comes out well). Mix all ingredients well (if you get lumps pass it all through a sieve). When the sherbet mixes with saliva (a neutral substance) it produces a tickling effect. You can also put a spoonful of the sherbet into a glass of water so the kids see how it becomes a fizzy drink. You can change colours and flavours of the sherbet by using orange, lemon or strawberry jelly powder. This is rather laborious (only worth doing it to show off at Christmas really) but the result is just spectacular. I used to do this with filo pastry and it made an easy (yet impressive) dessert, but making the pastry by hand takes this dessert to a totally different (and scrumptious) level. Mix well the flour, sun flour oil, salt, water and egg. You need to knead it for a really long time: knead it four or five times and then hit the pastry against the table (with strength!) Repeat this process at least 100 times (yes, really...it seems acwkard at the beginning but it is rather cathartic. The children thought it was fun for the first ten-ish times and then -predictably- got bored). Put it into a bowl, cover it with cling film and let it rest for 30 minutes. Meanwhile prepare the filling: melt the butter and fry the breadcrumbs into the melted butter until they become golden. Cut the apples into small slices and toss them with the lemon jounce so that they do not become dark. Mix the apples, cinnamon, sugar, slices almond, raisins and half of the breadcrumbs. Now comes the only difficult bit: you need to stretch the pastry until it becomes transparent. For this you need to cover a table with a tablecloth (preferably a printed or coloured one). Sprinkle flour on top of the tablecloth and then start stretching the pastry first with the rolling pin and then with the back of your hands and your fingers until you can see the printing or colour of the tablecloth through it. The thinner the pastry the more delicate the apflestrudle. Sprinkle the remaining breadcrumbs on the pastry and then add put the apples mixture over one half of the pastry. Fold the two shorter sides as if it is an envelope. Then roll the mixture and pastry as if it is a swiss roll. Put the roll on a tray lined with baking paper (making a u-shape if it is too big for the over tray). Paint the pastry with the remaining egg (beaten) and bake for 35-40 minutes until it becomes golden. After it is baked just sprinkle it with glass sugar and eat while it is warm (on its own or with cream or vanilla ice-cream).